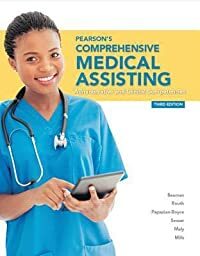 Pearson's Comprehensive Medical Assisting, Third Edition, provides students with the right procedural, people, and professional skills needed to succeed in the medical assisting profession. Teaching and Learning Experience Offers a step-by-step, competency-based approach that covers virtually all facets of the medical assisting profession: Procedural Skills--Speaks directly to the medical assisting student, presenting all the procedures and tasks that are relevant to the medical assistant role. People Skills--Covers people and communication skills that are essential to being a successful medical assistant. Professional Skills--Instills concepts and critical thinking skills needed to succeed as a medical assistant professional.